Whether you are a resident or just passing through New York City, there is no better way to enjoy the city than the lovely restaurant that offers some of the top-notch brunches. Finding them might not be as easy as it sounds but there is no need to worry as we have done most of the work for you. You will realize that in this article we have not only filtered but also researched some of the best brunch spots in the city ensuring that you enjoy your meal. Here are some of the best five brunch spots that are available for anyone in the city. 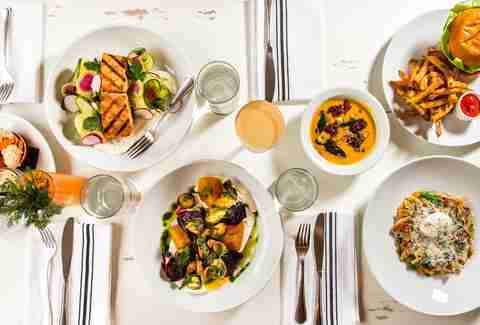 Café Mogador is one of the Moroccan restaurants that is in New York city that offer some of the best brunch available. Most of the food lovers would not have imagined that this is possible but truth be told it is with this joint. They offer delicious and fresh product making the whole experience one to look forward to. Apart from the food being fresh and delicious, it is also very affordable and plus their services is one that cannot miss being mentioned. The restaurant might be tricky to locate because it is not only a small place but also very cozy. It is situated in New York city neighboring the Murray Hill and is best known because of the French delicacies provided. The French flair that is so famous with this restaurant makes the whole experience very affordable with such an amazing service despite the fact that the place is always so cramped. There is no way one is in New York and have not tried the delicacies found in Jacob's pickles. There is a very huge confusion when you mention the name to anyone because the assumption is that they offer more pickles and no other varieties. That is not the case, their menu is one of the most exciting available in the city. This top brunch spot was launched in the year 2011 at the upper side of New York City and ever since it has always been a food delight to nearly any visitor and regulars alike. When you are into brunches then there is no other place in New York city that offers some of the best that include egg benedicts with Cajun-inspired shrimps with some of the top-notch friend tilapia with an addition of the best brie cheese and fig jam. The spot is easily located in Astoria and the best way to enjoy your meal here is before 10 am, this is because you will be in a very good position to avoid some of the large crowd that is so common with the place. When you are in Brooklyn, there is no way you can miss to get some of the best Chicken and waffles that New York has to offer. This is one of the delicacies that has made buttermilk channel be what it is today. The joint has maintained this tradition for a while now and every time you try out their food it always feels like the first time.